5Welcome to the world of Autodesk Maya 2018. Autodesk Maya 2018 is a powerful, integrated 3D modeling, animation, visual effects, and rendering software developed by Autodesk Inc. This integrated node based 3D software finds its application in the development of films, games, and design projects. A wide range of 3D visual effects, computer graphics, and character animation tools make it an ideal platform for 3D artists. The intuitive user interface and workflow tools of Maya 2018 have made the job of design visualization specialists a lot easier. 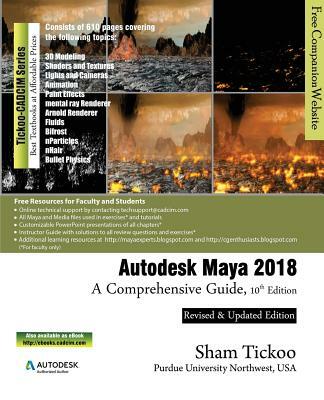 Autodesk Maya 2018: A Comprehensive Guide textbook covers all features of Autodesk Maya 2018 in a simple, lucid, and comprehensive manner. It aims at harnessing the power of Autodesk Maya 2018 for 3D and visual effects artists, and designers. This textbook will help you transform your imagination into reality with ease. Also, it will unleash your creativity, thus helping you create realistic 3D models, animation, and visual effects. It caters to the needs of both the novice and advanced users of Maya 2018 and is ideally suited for learning at your convenience and at your pace.